The SmartBench is a combination of software and hardware controls that allows the programming of sequential events by means of entering functions by number into step locations on a touchscreen. Functions may react to specified inputs, energize or deenergize outputs, perform timed “waits” or detect timed or out of sequence faults. As configured in the picture above, there are 32 digital inputs and 32 digital outputs grouped into 8 4in/4out cable ports which can be connected to configured stations such as the assembly pallet shown above. Functions are then allowed to be named by the programmer by means of a pop-up alphanumeric touchscreen on the HMI. The system will automatically start at the first programmed step or function, proceeding to the next when the current step’s completion is accomplished. This will continue until a non-programmed or zero step is encountered after which the sequence will start over. 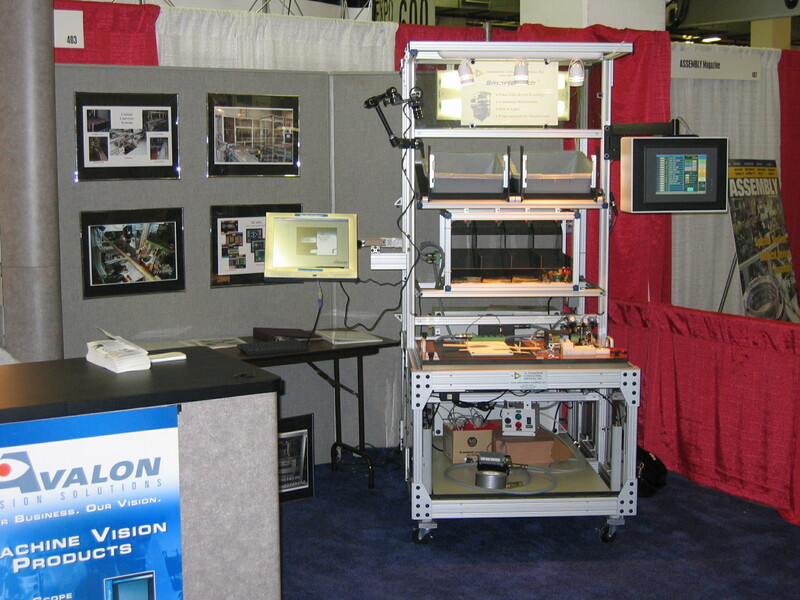 The operating system of the SmartBench shown above is a Koyo/Automation Direct PLC with 2 16 point input and 2 16 point output cards. There is also a slot mounted ethernet card installed for remote download of recipes or sequences from a PC, allowing the sequence to be arranged by means of a spreadsheet or database program such as Microsoft Excel or Access. 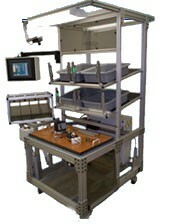 The current onboard operator interface or HMI is a Maple Systems touchscreen with onboard recipe memory. The PLC performs the logic, sequencing and timing functions and rearranging of function names into their proper step locations, fault detection and password access to screens. The operator interface stores the configured sequences and allows entry of alphanumeric data descriptions into the PLC registers associated with each function. The SmartBench was created as a replacement for several dedicated purpose assembly stations at TRW Koyo, Vonore, Tennessee. It was meant to be able to individually replace any of the existing machines as they were retooled for the next program year of hose assemblies. At the Greenville tradeshow a pallet was built where attendees could assemble a balsa airplane. As the first part, the body, was inserted into the tooling a latch was activated locking the piece in place. Lights would blink on both the bins and the tooling indicating where the operator was to get or place the next component. After all parts were detected to be in place, a camera was triggered to inspect the plane for items such as upside down wings or missing components. After successful completion the plane would be released and the sequence started over. The trade show was quite successful in acquiring new projects, though most were related to other applications. Although a Koyo PLC and a Maple Systems touchscreen were used for the prototype SmartBench, the programming techniques can be used on any platform that has the same capabilities. The most cost effective form would be to put the operating system on a microprocessor and create a circuit card that could interface with I/O. 2 Pings/Trackbacks for "The SmartBench"